Attributes to define the search form (filter) settings (Alignment, Width, Criteria, etc). Display Condition - Display	search condition so that the user can choose an option. Keep Values - When enbaled the values of the last filter are saved and displayed when the user return the search screen. Preserver fields and Orders - Determine which values to keep to each search form. 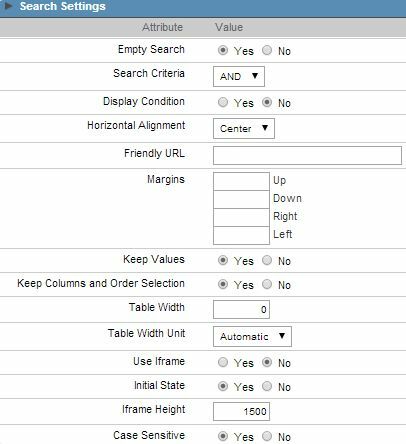 Table Width - Define the search form HTML width value. Use Iframe - When enbaled it displays the search form and results in the same window , in two FRAMES, one above of the other. Initial State - When enbaled it displays initially the filter with grid inside of the located iframe below the filter. This option is associate “To use Iframe”. Iframe Height - Height in pixels of the serach form results iframe. This option is associate “To use Iframe”. Case Sensitive - Considers Case Sensitive.